At the mixed-use Taxi Development, an old industrial complex in North Denver, a former freight yard finds a new life as a green gathering space. The outdoor courtyard, dubbed FR8scape, was designed by GroundWorks Design, who took inspiration from both its industrial life and its original roots as field by a river. Asphalt was removed in places to make way for native grasses and trees and allow for storm water infiltration, while leftover freight remnants like an old trailer bed and a forklift were repurposed into the new design. 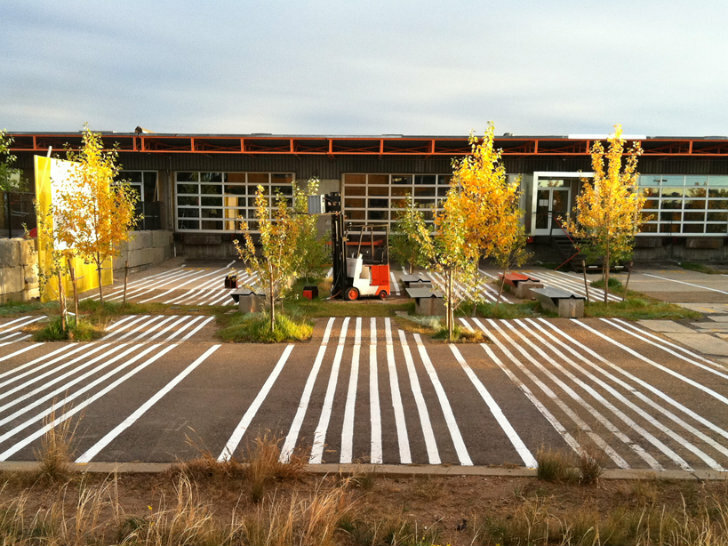 FR8scape is a public courtyard and creative gathering space in front of the Freight building at the mixed-use Taxi Development in North Denver. Bordered by the Platte River to the east, the entire project is an adaptive reuse of former industrial buildings into office and commercial space. The FR8scape courtyard used to serve as a trucking terminal and loading yard for big trucks. The asphalt wasteland was destined for a new life where employees, customers and visitors could gather for events, meetings or relaxation. GroundWorks goal was to leave an imprint of both its former life as a field by a river and the industrial trucking yard. Working with a limited budget, the idea was to reuse materials on site rather than bring in anything new. Sections of asphalt were cut away and saved for use at a later time. The holes into the ground received new good soil and native grass and cottonwood whip plantings. Permeable paving materials and storm water direction allows water to infiltrate before hitting the adjacent river. Concrete blocks were repositioned to serve as benches and seating, while an old truck trailer was repurposed to serve as a foot bridge across a drainage ditch. An old forklift sits in the middle like a statue and also serves as the projector housing for movie nights during the summer. 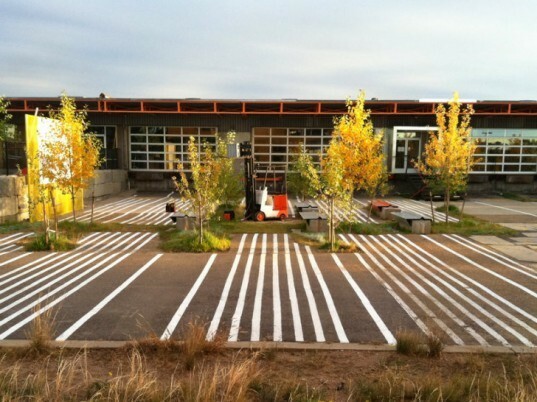 Lines and numbers were repainted onto the tarmac to remind visitors of the former life as a truck yard. 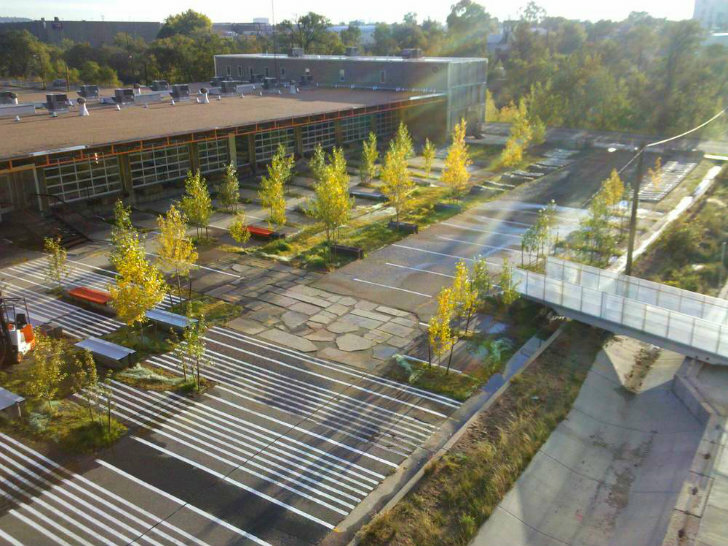 FR8scape is a public courtyard and creative gathering space in front of the Freight building at the mixed-use Taxi Development in North Denver. Bordered by the Platte River to the east, the entire project is an adaptive reuse of former industrial buildings into office and commercial space. The FR8scape courtyard used to serve as a trucking terminal and loading yard for big trucks. The asphalt wasteland was destined for a new life where employees, customers and visitors could gather for events, meetings or relaxation. GroundWorks goal was to leave an imprint of both its former life as a field by a river and the industrial trucking yard. Working with a limited budget, the idea was to reuse materials on site rather than bring in anything new. Sections of asphalt were cut away and saved for use at a later time. The holes into the ground received new good soil and native grass and cottonwood whip plantings. Permeable paving materials and storm water direction allows water to infiltrate before hitting the adjacent river. Taxi Development with the Freight building and FR8scape located above the wording.